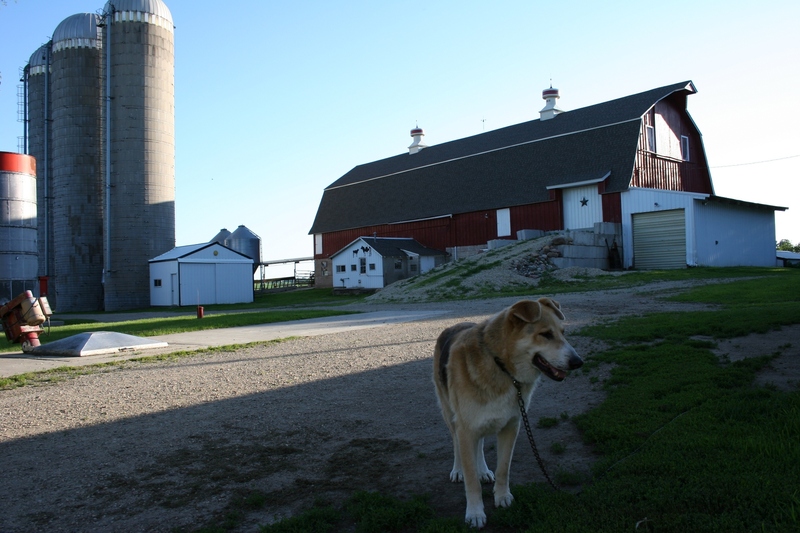 If you look closely, you will see the farm dog in front of the 1915 farmhouse to which a machine shed was added. WIDE SWATHS OF SHADOWS sliced across the farmyard as the sun edged toward the horizon on a whisper of a summer night. 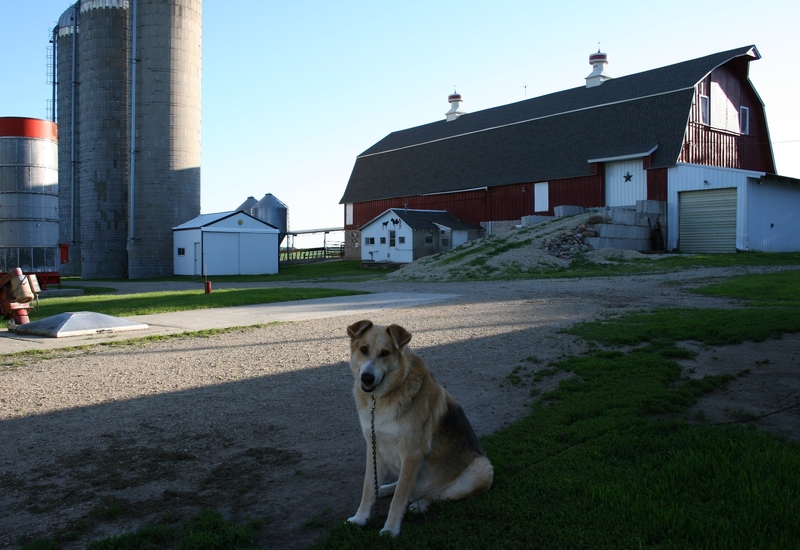 The old farm dog, tethered to a chain next to the 1915 farmhouse-turned-granary-turned storage shed, rose from his resting place on a paw-worn patch of grass. Water and food bowls rested on the single cement step nearby, within his reach. The dog didn’t bark, didn’t lunge, just let me be as I moved into his territory. He stood, paced and then eased onto his haunches, acknowledging my non-threatening presence as I dropped to one knee to view the world from his perspective. I wanted only to photograph this guardian of the farm on a summer evening as absolutely picture-perfect as any day you’ll get in Minnesota. Still. Serene. Colors sharp like new crayons. Sunlight, eye-blinding bright to the west, on the other side of the barn, outside the dogs’ reach. This June evening, for these few hours, this watchdog could not roam the farmyard. He could only eye the visitors seated across the gravel drive at a picnic table. Friends gathered for pizza and lemonade sweetened with fresh strawberries and then more berries atop angel food cake and ice cream topped off with whipped cream. Laughter punctuated conversation. Then bibles flipped open to words written upon pages thin as butterfly wings. The shrill call of a cardinal pierced the silence between ideas shared and scripture read. Then, as the farm dog watched, the friends bowed their heads in a prayer of thanksgiving—gratitude to God for protecting the owners of this farm from serious injury in a motor vehicle accident the previous day. A rear-end collision. Truck spinning, tipping onto its side along a Minnesota highway. Glass in teeth and waistbands and hair. None of this the guard dog knew on this most blessed of summer evenings on a Minnesota farm. TODAY, JUNE 30, has been designated as “Maroon Day” in Minnesota, historically the deadliest day on our state’s roadways. Since 2000, more fatal crashes have occurred on this final day of June, leading into the July Fourth holiday, than on any other day of the year. Statistics show 30 fatal crashes resulting in 35 deaths. All of Minnesota’s nearly 600 state troopers, in their signature maroon vehicles, will be patrolling today. Buckle up. Drive carefully and be safe. I URGED HIM to speed up, to catch up to that yellow jeep ahead of us. “I want to take a picture,” I explained, and my husband obliged although he thought me a bit crazy. And maybe I am sometimes. But that canary yellow jeep, the single visual jolt of brightness on yet another recent dreary weekend, tripped something in my brain. 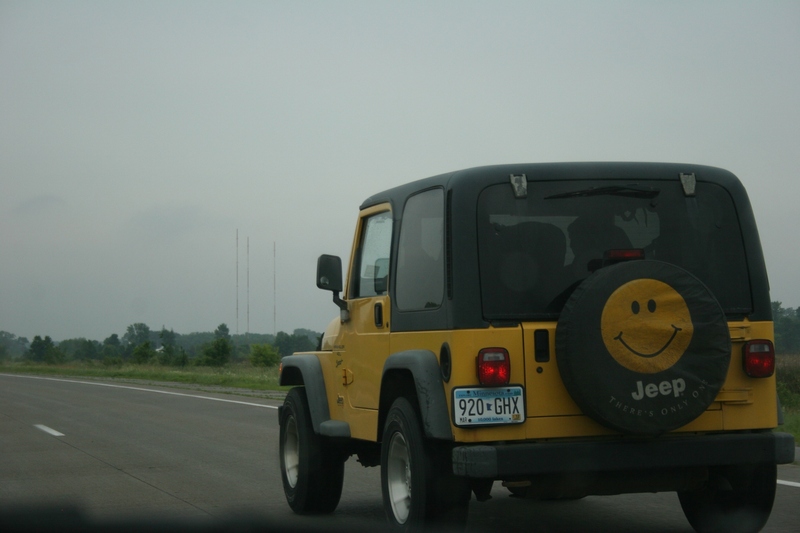 So, given that context, the yellow jeep with the smiley face wheel cover made me smile as we traveled on U.S. Highway 14 between Mankato and Eagle Lake recently. Smiley faces, no matter where I spot them, always increase my happiness quotient. My appreciation of smiley faces stretches back further than I’d like to admit these days. This happiness symbol popped up everywhere when I was in high school, which would be, yes, the 1970s. Oh, how I wish I still had my smiley face bulletin board and my smiley face button. 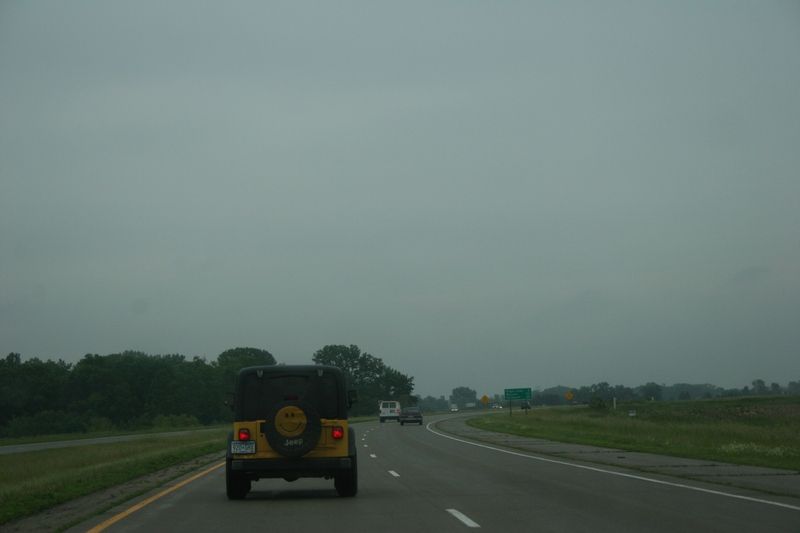 So there, that should explain why I wanted to photograph the yellow jeep on a drizzly Saturday afternoon along a Minnesota highway. The smiley face represents a link to my past, to those turbulent teen years when I needed a bright smile as much then as I sometimes still need one some four decades later. I can’t think of another symbol with such upbeat universal appeal. Can you? Do you, like me, have fond memories of the smiley face? I’d like to hear. 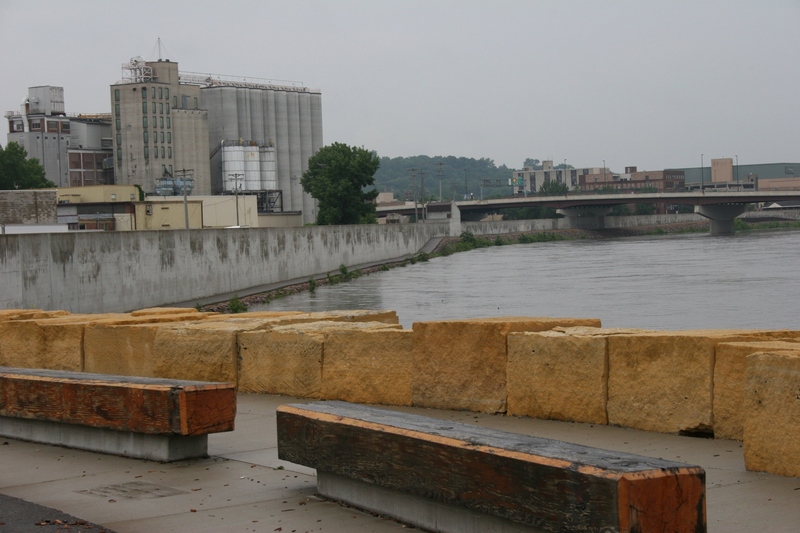 A view of the Minnesota River as seen from Riverfront Park, looking toward downtown Mankato. THE MANKATO PARK SEEMS, in many ways, an ideal setting for poetry. The usually playful Minnesota River bumps against the land here, acting on this Saturday afternoon like a willful, unruly child. On the other side of Riverfront Park, across the tracks, historic buildings stand like forlorn children, neglected, waiting for someone to care. 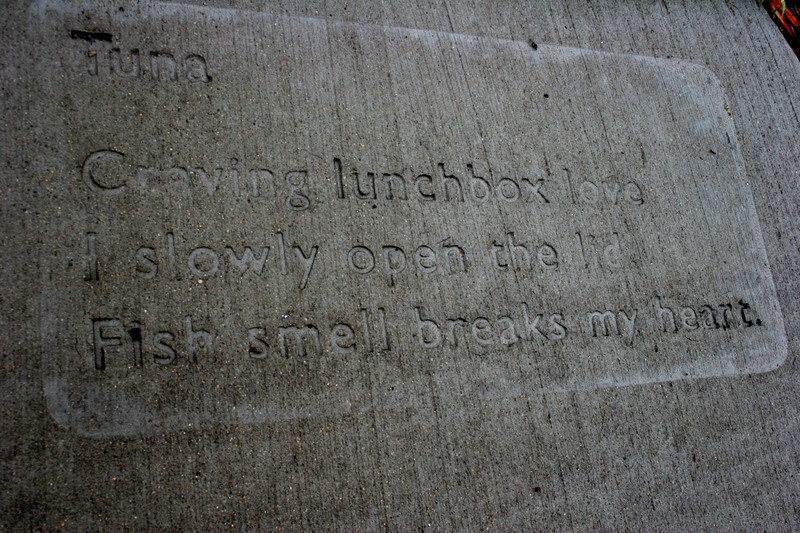 I have come here at this late afternoon hour to read the poetry imprinted upon cement. Occasionally the sky spits rain at me as I follow the gray sidewalk which mimics the gray day. "Curve around the corner/You are free/To change directions/Or your mind," reads this poem by Marlys Neufeld of Hanska. the father of them all. A snippet of the poem, "Minnesota." I've edited this image so that you can better read the words. 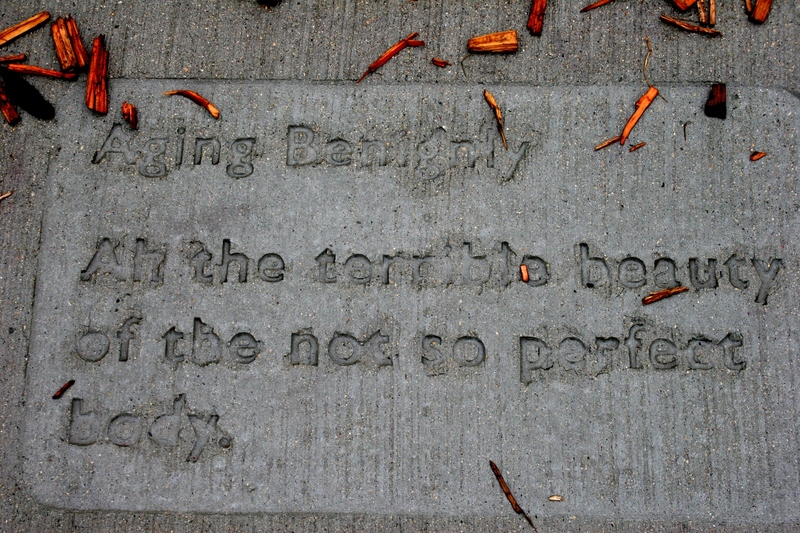 The poems are, unfortunately, a bit difficult to read because of a lack of color contrast between the letters and the cement. The poem by Ikars Sarma of Mankato refers to the hanging of 38 Dakota here on December 26, 1862. A heavy thought to match the heaviness of the sky, the raging of the river, the anger that still simmers over this shameful moment in this city’s history. In this edited photo, read Susan Stevens Chambers' poem about aging. Nearby kids scramble up a rock wall as I struggle to lift my aging bones from the sidewalk where I have bent close to read and photograph Chambers’ poem. I slowly open the lid. Fish smell breaks my heart. The poem that causes me to remember all the tuna I ate during my last two years of college. Exactly. I ate too much tuna in this college town between 1976 and 1978. I could write my own poem about cramming tuna sandwiches while cranking out stories at the Mankato State University (I still can’t call it Minnesota State University, Mankato) student newspaper, The Reporter. Cariveau’s writing reminds me of those years so long ago when I was young and only beginning my journey into the poetry of life. 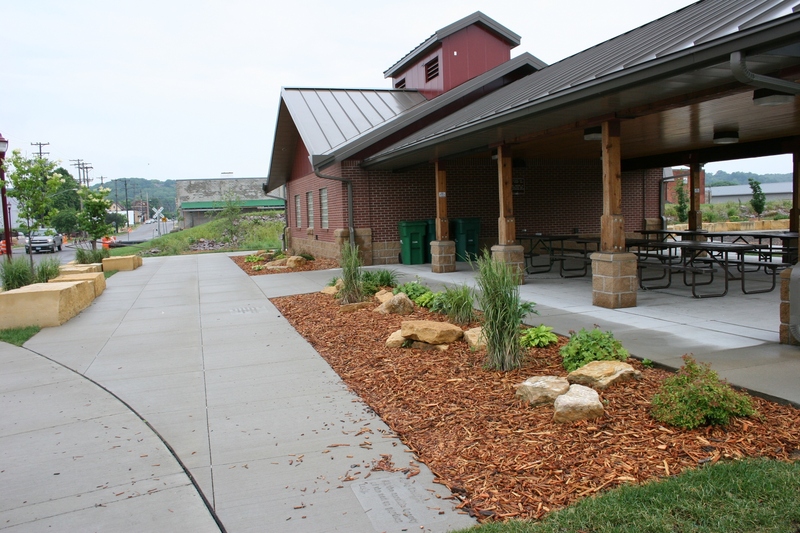 WordWalk poems are imprinted on the sidewalk circling this restroom/shelter facility at Riverfront Park in Mankato. 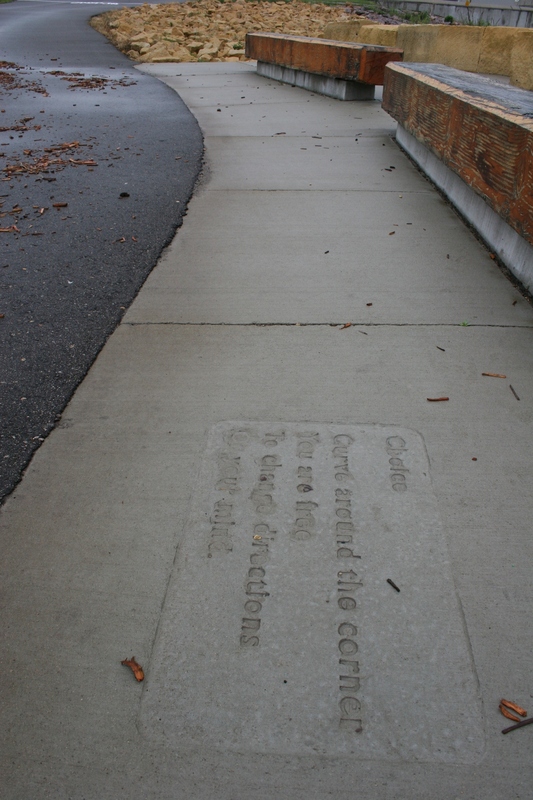 FOR MORE INFORMATION about Mankato’s public sidewalk poetry, WordWalk, click here and here. 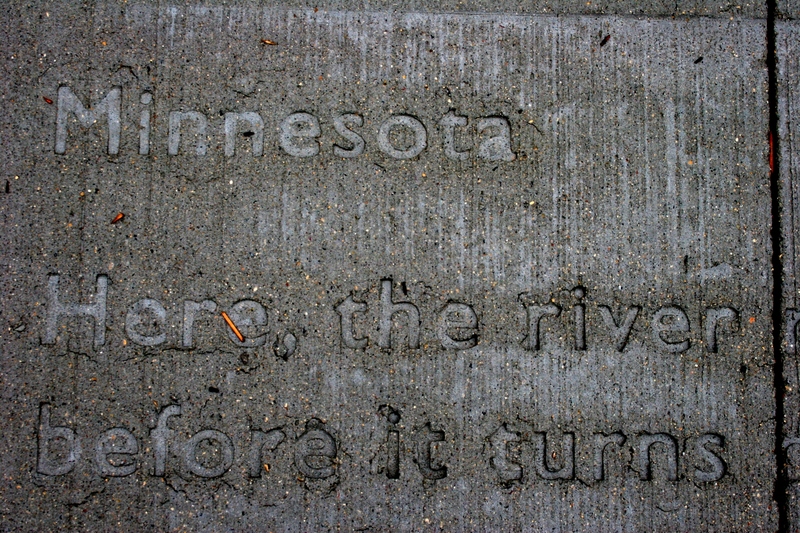 At least two other Minnesota cities, of which I am aware, have sidewalk poetry: St. Paul and now Northfield. WHAT’S YOUR OPINION on sidewalk poetry? Do you like it, or not? 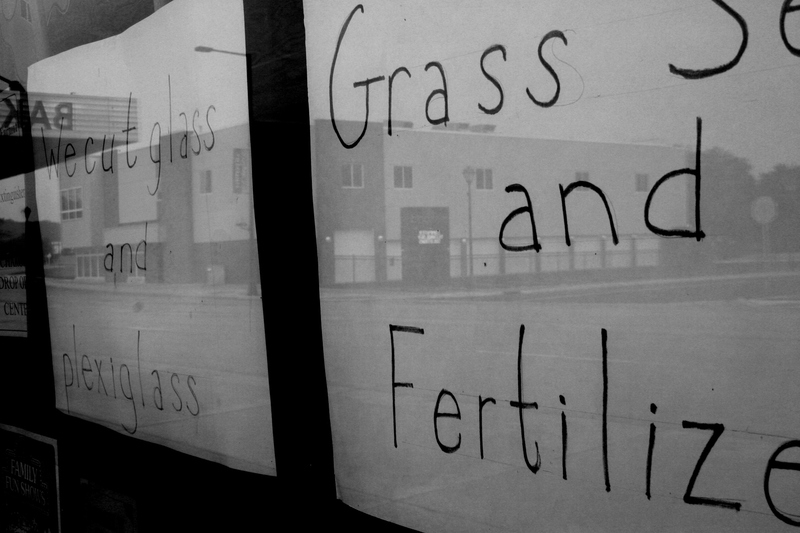 Would you like to see more such public poetry in Minnesota communities? Why or why not? 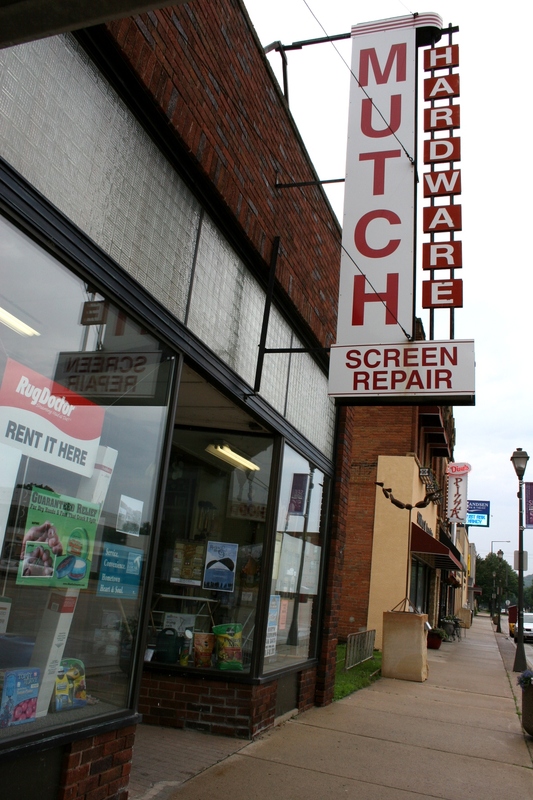 Buildings across the street reflect in the windows of Mutch Northside Hardware in North Mankato where these signs hang on a front plate-glass window. I didn’t need grass seed or fertilizer or any glass cut. Yet, the signage drew me to the storefront plate-glass window of the hardware store along Belgrade Avenue in North Mankato. How often do you see business signs like this with letters printed in near-perfect penmanship between two penciled ruler lines on white tagboard? After I admired the simplicity of this advertising in a world of mass-produced, flashy, signage, I noticed the old screen door. That did it. I was smitten with this place, this Mutch Northside Hardware that, from the exterior, reminded me of the small town hardware stores of my youth. You know, the kind of store where you can buy everything and anything. The place packed with merchandise from floor to ceiling, aisles narrow as a sidewalk crack. Nails and bolts jumbled in scarred cubbies. Belts dangling from hooks on pegboard. Wooden floors that creak. 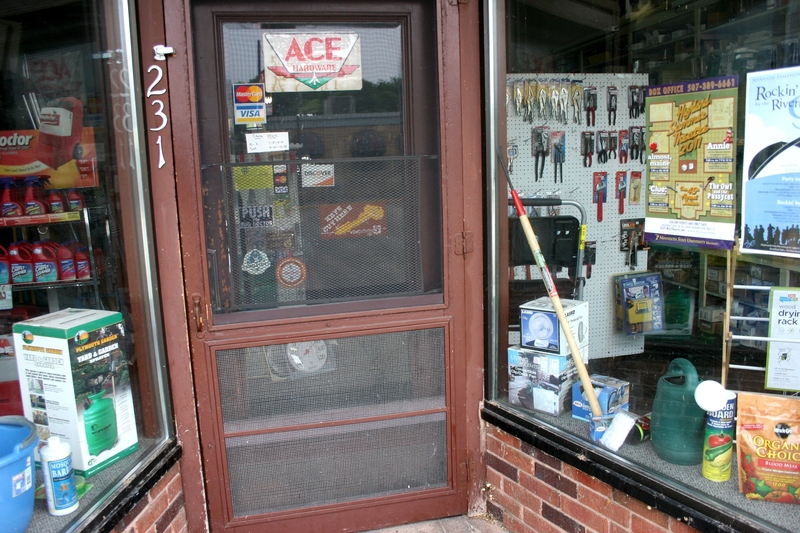 Mutch Hardware is crammed with merchandise, some of it displayed in the window fronts. 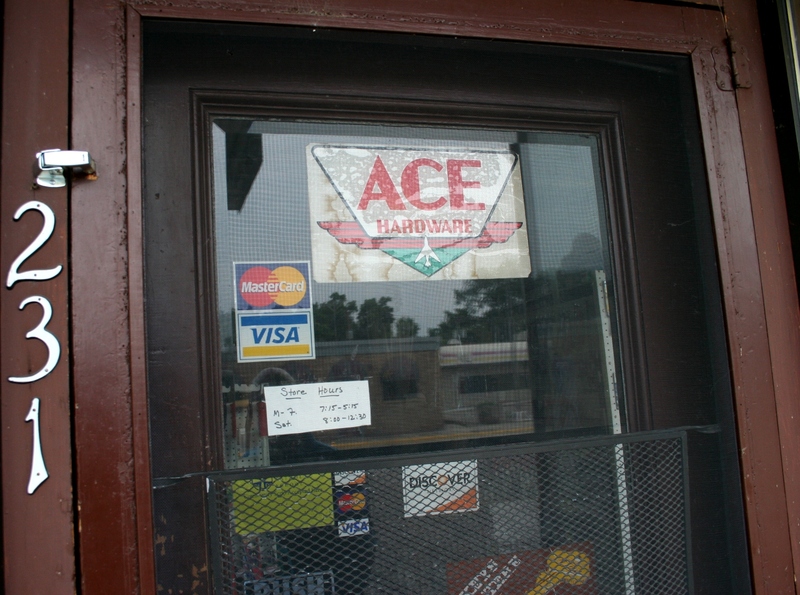 An old ACE Hardware sign decorates the front door where a handwritten sign is posted listing store hours. I could almost hear the vintage screen door slam shut behind me as I stood outside the closed hardware store, hands cupped around my eyes, peering inside. It was late Saturday afternoon and I was hours too late to step inside Mutch Hardware, much to my disappointment. But that didn’t stop a flood of memories from washing over me. 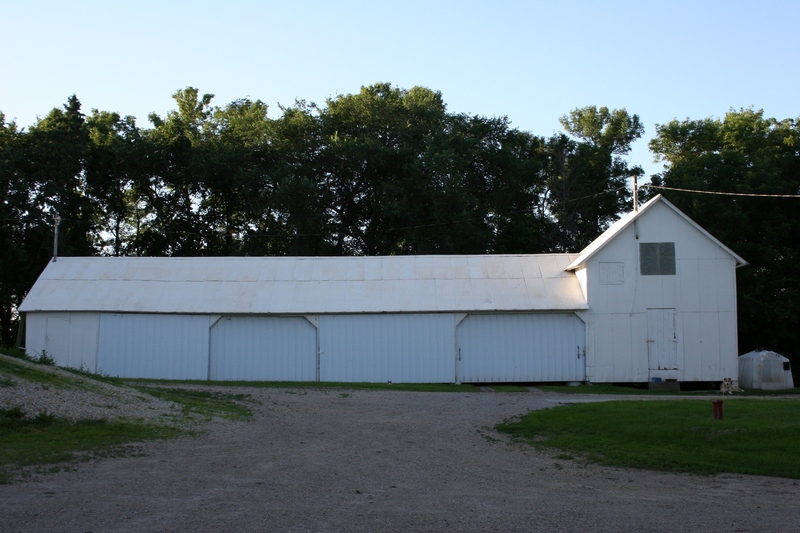 Memories of going to town with my dad, stopping at Joe Engel’s Hardware store on Vesta’s main street to pick up a few bolts or maybe a belt or something else for the farm. My siblings and I had another reason for hitching a ride to the southwestern Minnesota hardware store with our dad. Joe Engel’s supplied our ammo—coiled rolls of red-perforated paper pocked with gun powder for our toy cap guns. This was the 1960s, and even though not politically-correct today, an era of playing “Cowboys and Indians.” I remember those days with a depth of fondness that I doubt today’s tech-oriented kids will ever experience. I would like to take each of them inside a business like Mutch Hardware, where I expect helpful, personal service, care and friendliness accompany each purchase. Places like this seem rare in our fast-paced world of big box stores run by corporations in far away cities. Few mom-and-pop stores can survive in today’s economy. That is reality. I’m not a prima donna; I shop chain stores as much as anyone. Yet when I see a business such as Mutch Northside Hardware in North Mankato, I take notice. I appreciate the hardworking men and women who, as independent business owners, still offer us a shopping option. Outside Mutch Northside Hardware, a place reminiscent of bygone days. DOES AN OLD-FASHIONED mom-and-pop type business like Mutch Northside Hardware exist in your community, or do you know of one somewhere? I’d like to hear. Tell me about it by submitting a comment. 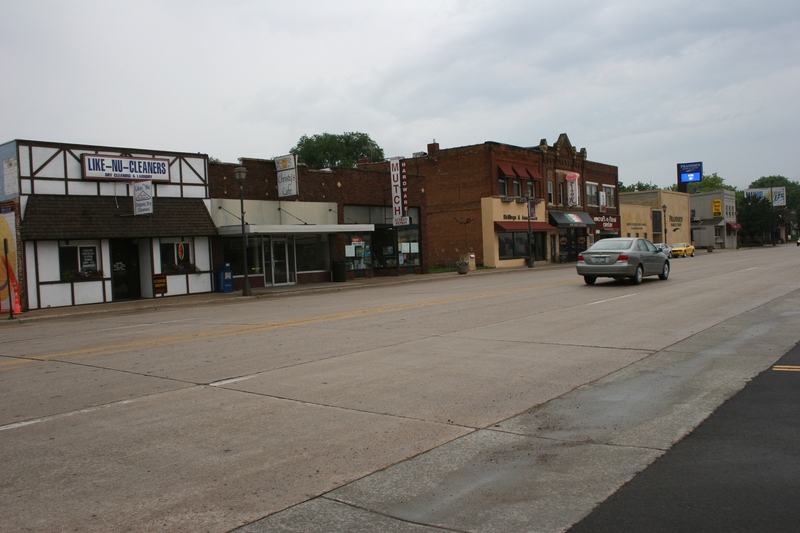 This image of a section of Belgrade Avenue in North Mankato shows the following businesses, from left: Like-Nu-Cleaners, Christy's Cafe, Mutch Northside Hardware, Skillings & Associates, Dino's Gourmet Pizzeria, Craft-n-Floral Center, the U.S. Post Office, Frandsen Bank & Trust and Bobby Joe's Pub. 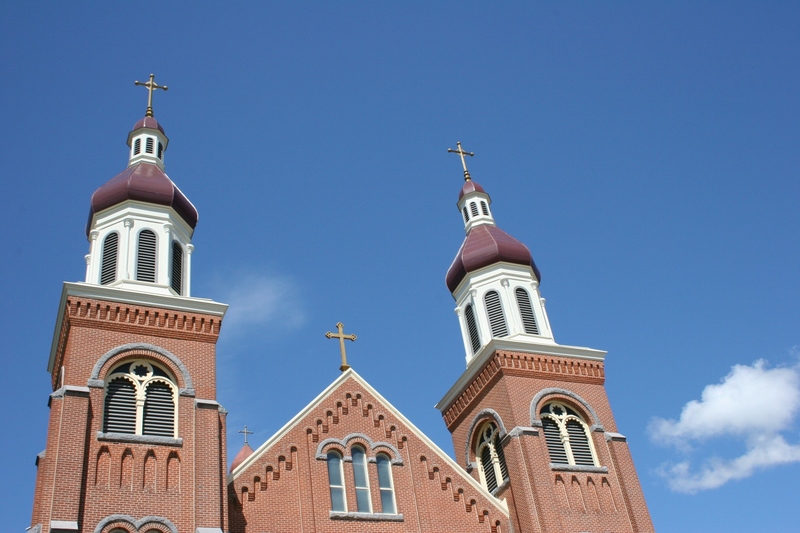 The steeples of St. Mary's Catholic Church of Melrose. I STOOD THERE. Just stood there. For minutes, taking in the glorious splendor before me. The cornflower blue of the arched ceiling. The pillars. Pews—endless carved pews stretching from the fonts of holy water to the steps leading to the altar. 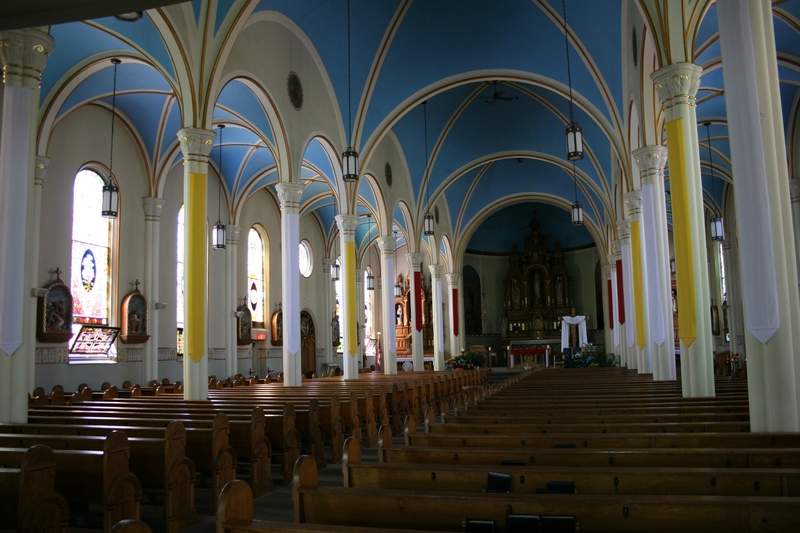 A view from the back of St. Mary's Catholic Church looking toward the main altar. 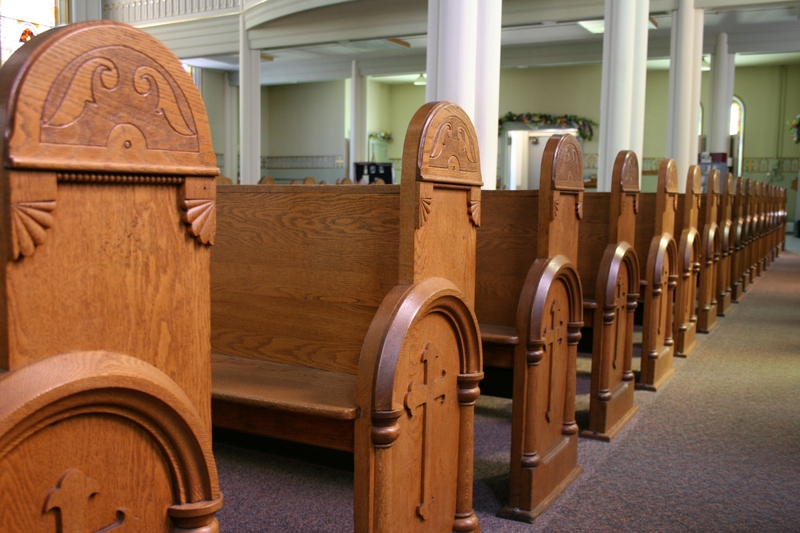 I didn't even try to count the hand-carved pews that grace this church. But they are many. 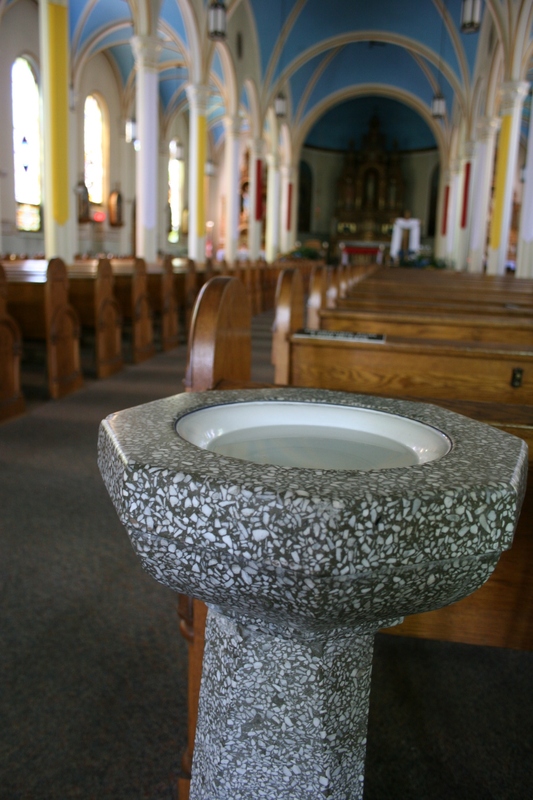 A stone font holding holy water at the back of the church. Such beauty. Such holiness. Such wonderment. 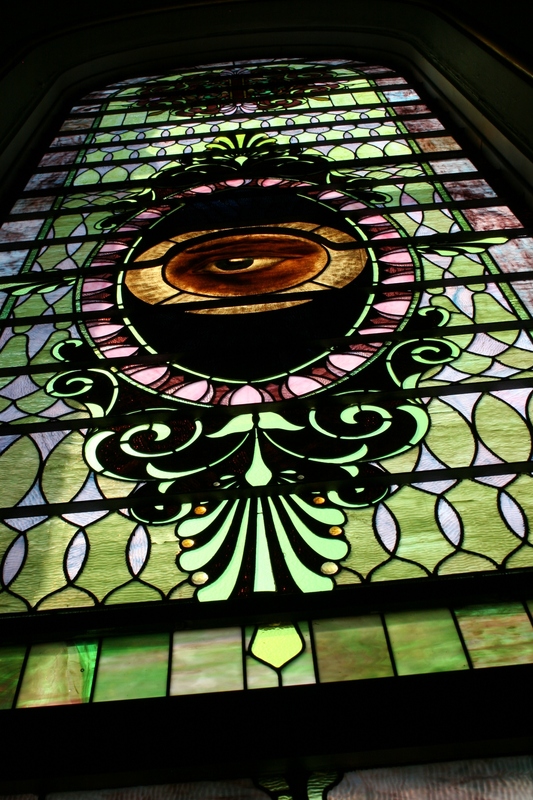 Opulent, stained glass windows bedecking the sanctuary like jewels on a crown. One of too many stained glass windows to count. Statues fit for the finest of museums. 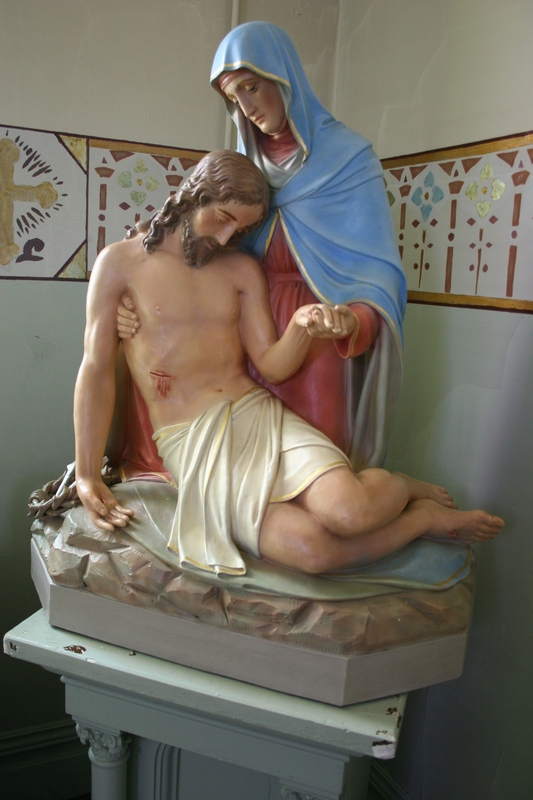 This statue of Jesus and Mary sits at the back of the church. And then I moved, not sure which direction to go, wondering how I could possibly see every detail. Prayerful hands. Flickering candles. The frayed ends of the bell pull. Gold-leaf stenciled crosses. Worn wood. Angels in flight above the altar. 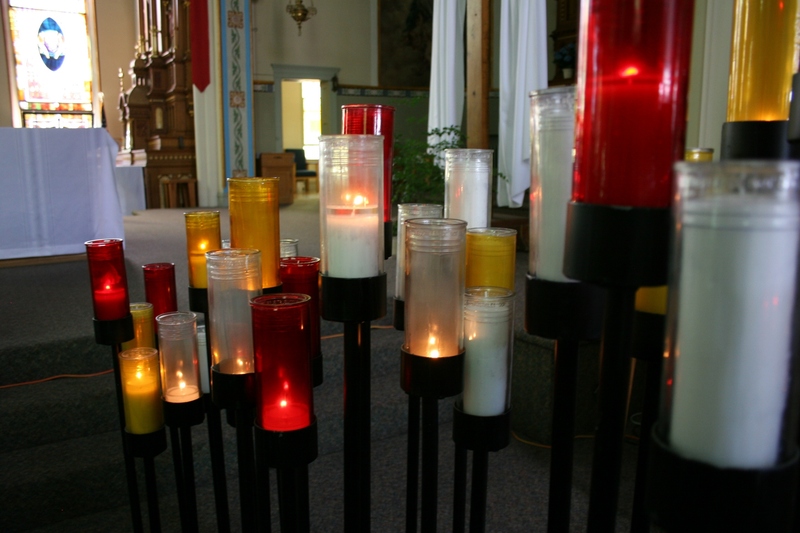 Clustered candles of prayer at St. Mary's. 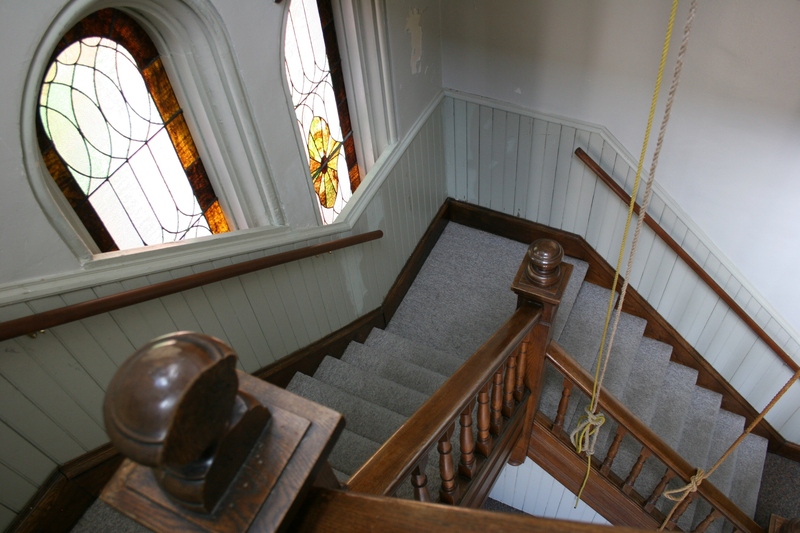 Bell ropes dangle by the balcony stairway. Two stairways lead to the balcony. 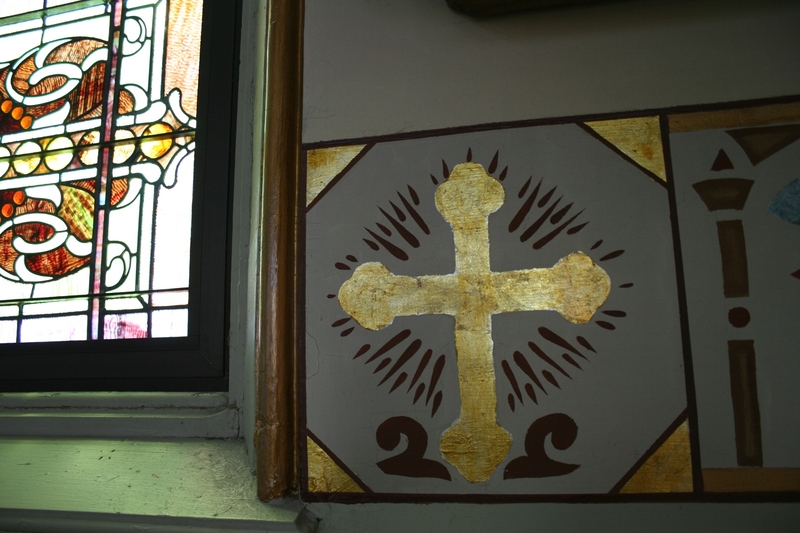 A gold-leafed stenciled cross borders a side wall of the sanctuary. My eyes swept across the Church of St. Mary’s, or St. Mary’s Catholic Church of Melrose. Choose the moniker you prefer. The name and the denomination of this 1898 church mattered not to me. I cared only for the heavenly feel of this holy place. How could I not be impressed by this multi-steepled house of worship next to the turkey plant and soaring above the landscape 100 miles northwest of the Twin Cities? How many times, if you travel Interstate 94 in central Minnesota, have you noticed those steeples while zipping by Melrose, but never taken the time to drive into town? Placed on the National Register of Historic Places in 1993, this Catholic church is worth a stop if you appreciate craftsmanship, art, history and reverent beauty beyond belief. The church rises above the land, defining Melrose. 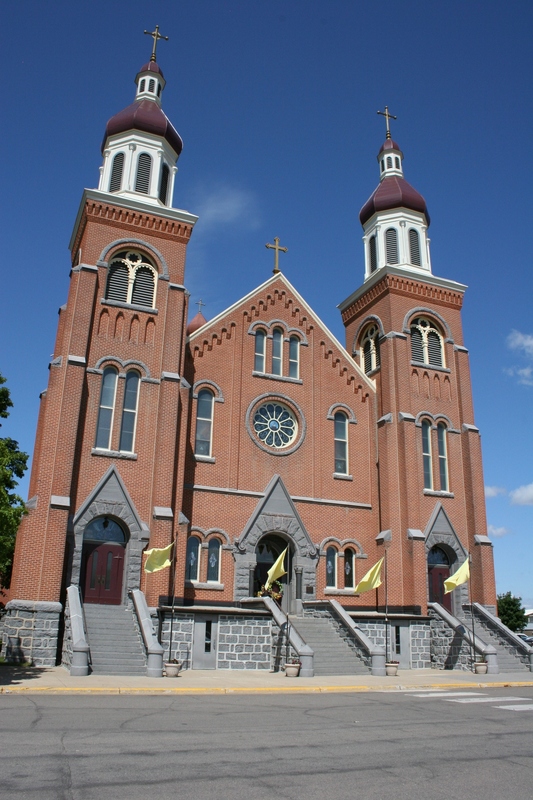 The 113-year-old building was constructed by the parishioners of St. Boniface and renamed St. Mary’s when St. Boniface and St. Patrick’s parishes merged in 1958. History runs deep here. You will see it in the hitching post out front, smell it in the incense, hear it in the creak of steps leading to the locked balcony. And if you listen closely, you can almost hear the whispered prayers of those who have come here on bended knees to lift up their sorrows to the Lord. I COULD NOT POSSIBLY share my many photos of St. Mary’s with you in one blog post. Please check back for more images in a future post. 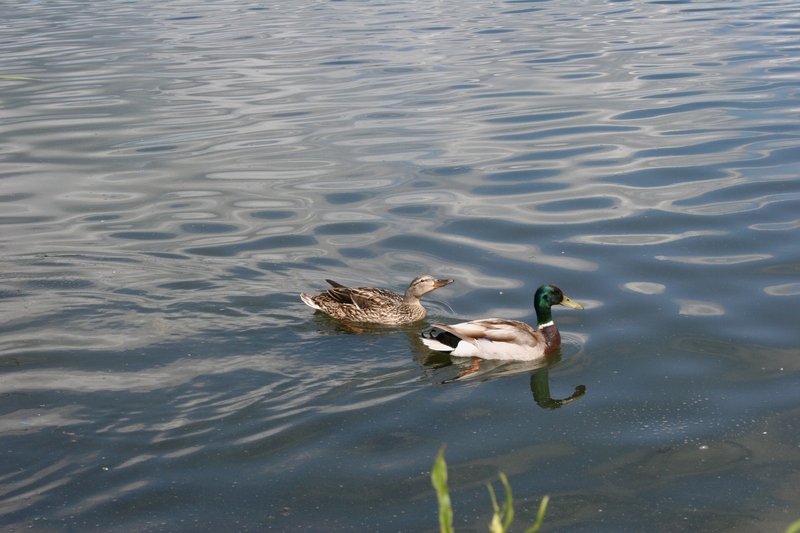 IT APPEARED TO BE nothing short of a love story played out on a west central Minnesota lake. 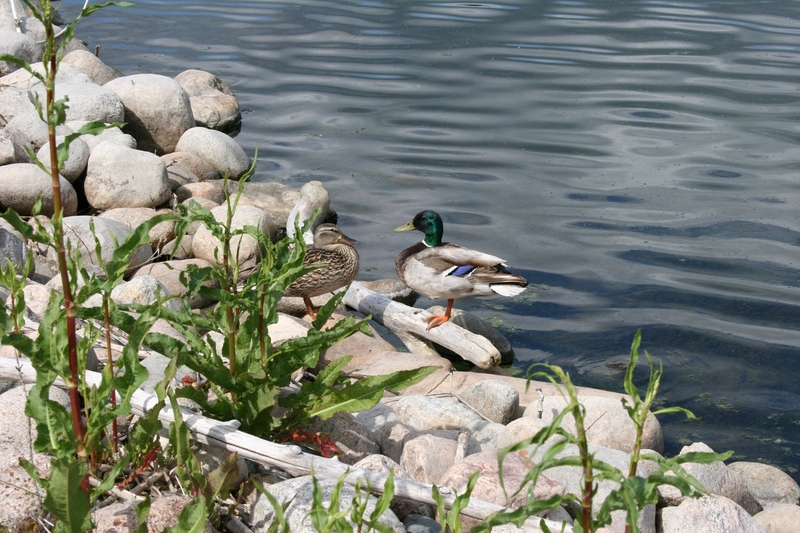 Two love birds—or more accurately, ducks—met along the shoreline of Lake Agnes in Alexandria which, to those of you who do not live in Minnesota, claims to be the birthplace of America what with the Kensington Runestone and all found here. 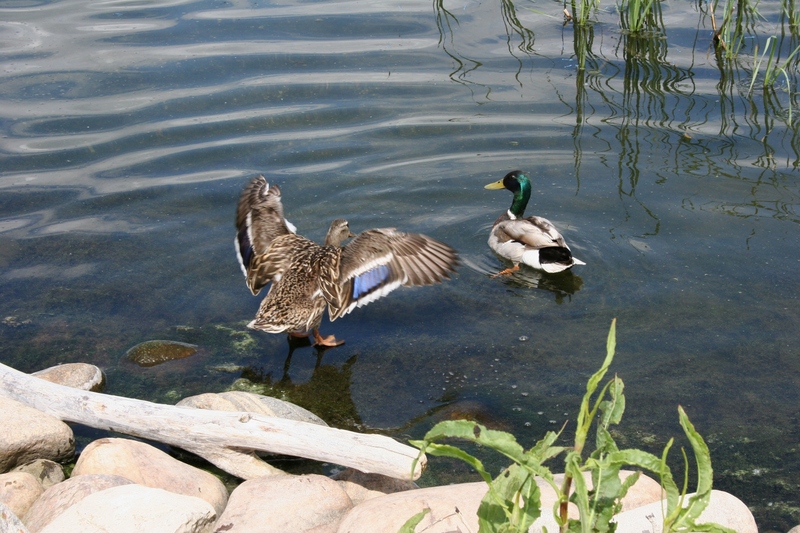 The mallards cared not one wit about the vikings or the Runestone or even me, watching their every move. 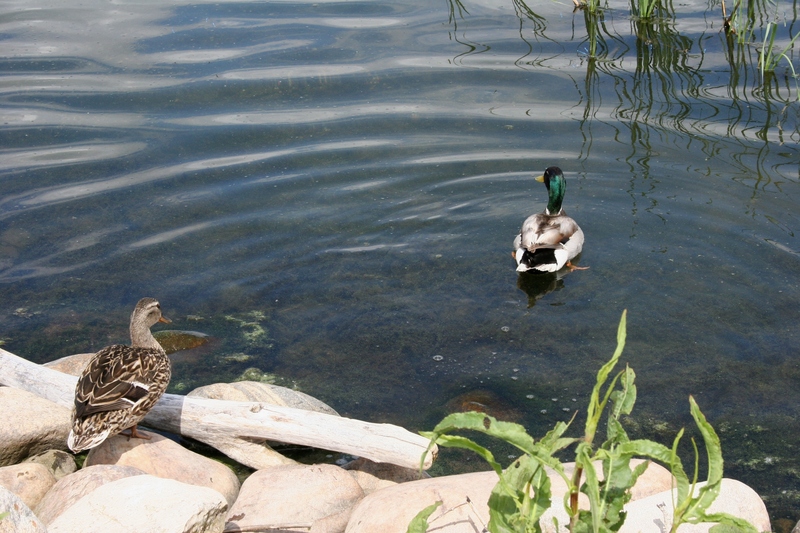 The drake and the hen had eyes only for each other. And so the romance spawned on Lake Agnes, on this lake with the name of Greek (not Scandinavian) origin meaning pure/holy/chaste. MY BROTHER-IN-LAW, Neil, lives in Minot. But he ranks as one of the lucky residents of this North Dakota city. His house lies outside—albeit less than a mile away—and several hundred feet above the flood zone. Yet, this Air Force man and Minnesota native isn’t sitting idly by because his home has not been threatened. He’s pitching in to help those who face the reality of losing their houses in the worst flooding since 1969. In an e-mail I received from Neil early this morning, he shares information, insights and, yes, even advice about the current situation—which he terms “exhausting and discouraging”—in his adopted hometown. The overwhelmed Souris River in Minot is expected to crest on Sunday, some five feet higher than any previous flood stage in recorded history for the area, Neil says. The old record was set in 1881, before Minot was founded. So that’s the situation facing this city, where some 12,000 residents, more than a quarter of the population, have been evacuated and where, says Neil, dikes in several neighborhoods were breached on Wednesday. Neil has assisted two families in exiting the city. Neil next joined efforts to help his boss’s family. His boss is deployed to Afghanistan. At this point my brother-in-law pauses and suggests that we all re-evaluate our possessions, deciding what we really need and what we don’t. “Go through your house and garage and get rid of anything that you haven’t laid eyes on or used in the past three years.” He intends to do exactly that at his Minot home, which is currently on the market; he’s been reassigned to an Air Force base in Missouri. When Neil and his wife, who is already in Missouri, purchased their house several years ago, they purposely stayed away from the flood zone. “A contractor that we spoke to before buying a house told us the down sides of several locations in this town. One specific neighborhood that he told us to steer clear of is the exact one that we helped my boss’s family move out of; he told us that he wouldn’t even consider building a house down there because the whole area was under water in the flood of ’69,” Neil says.